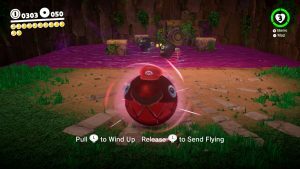 Capture the Chain Chomp and then ram him into the glowing rock to unlock the first Power Moon. 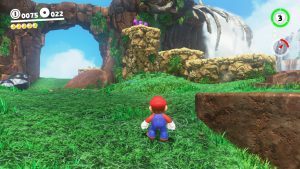 The Boss and final main mission of Cascade Kingdom. 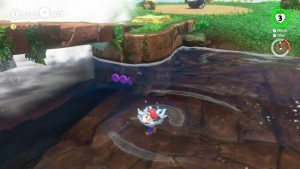 You need to throw Cappy at the Chain Chomp once to remove it’s hat and then Capture it. Keep away from boss as she tries to take a swing at you. Then pull away when she is tugging at the chain and let go to hit her. Repeat 2 more times. 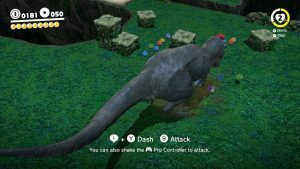 Use the far left Chain Chomp near the main area’s T Rex to smash the small stone near the left side wall to reveal a Power Moon. 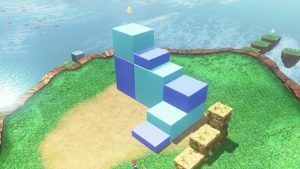 As you climb the first 2D puzzle you’ll be able to jump off to the left side near the top to get a hidden area with some coins and the Power Moon. Out in the open on the right side of the opening area. 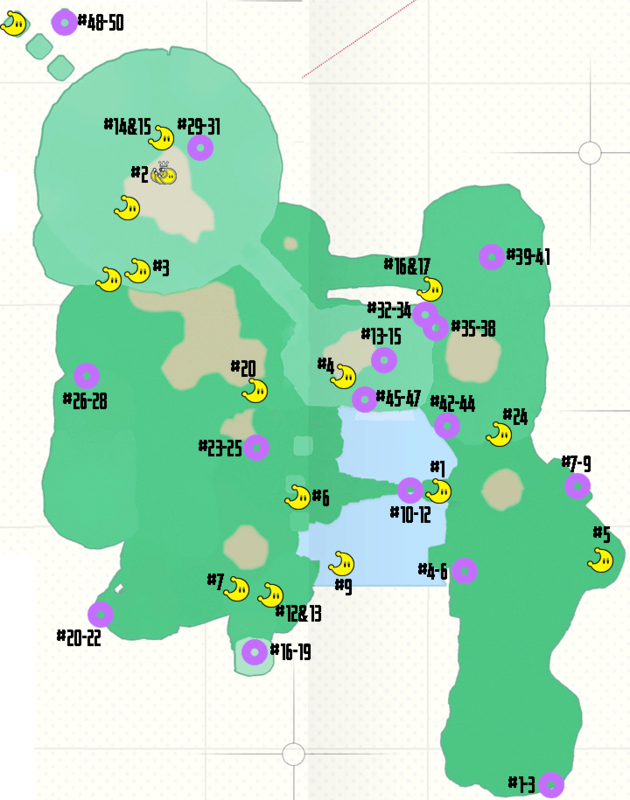 At the back right of the water area there is a treasure chest. Open it to reveal the Power Moon. Right out in the open. 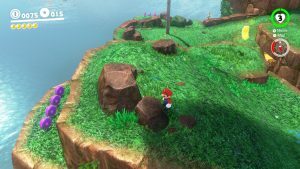 Use the Chain Chomp near the odyssey to break the rock and reveal the pipe to get up there. 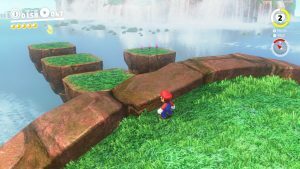 There is a series of 3 small platforms off the back of the area with Across the Floating Isles on it. 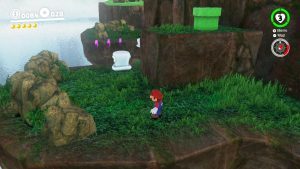 Technically 4 platforms as there is a side platform with some Kingdom Coins on it. To the left of the bridge is a mannequin. 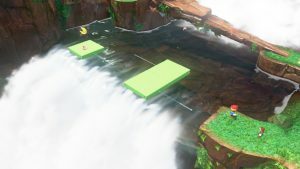 Throw Cappy at it to start the timed challenge. 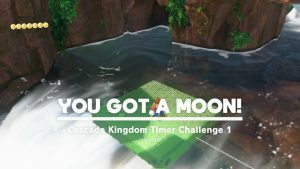 Get to all the platforms to get the Power Moon. 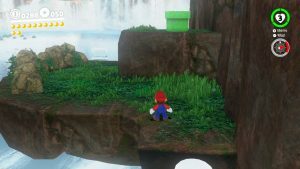 Up at Fossile Falls Heights where the boss battle happened, there will now be a Cascade Kingdom Timer Challenge 2 to teach you how to do the Triple Jump. 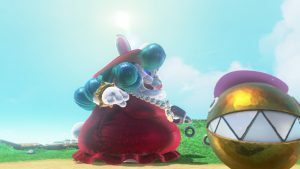 11 – Good Morning, Captain Toad! 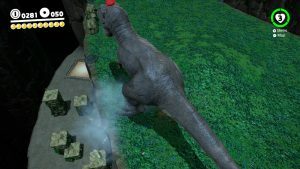 Then head to the T-Rex side where you will see a metal box. 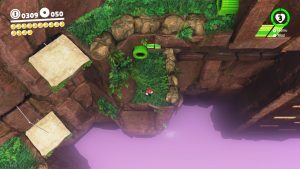 Can’t do anything with that now but you can drop down to a small platform below it (that is directly over the 3 Chain Chomps) and here Captain Todd will give you Good Morning, Captain Toad!. 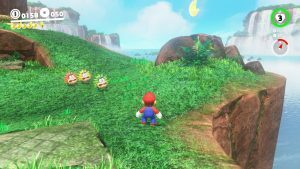 12 – Dinosaur Nest: Big Cleanup! 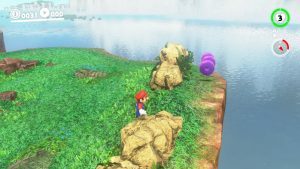 13 – Dinosaur Nest: Running Wild! Behind the Top of the Big Stump is a door down on a ledge leading to a cave with the T Rex in it. This moon is acquired by hitting all the small hedgehog enemies in the top area. You have to Capture the T Rex for this one. 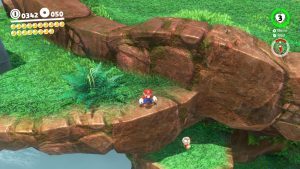 Grab him and guide him over the back ledge and use him to smash the rocks. 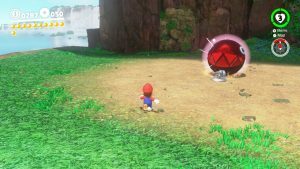 The closest to the wall and the bounce pad contains the Power Moon. 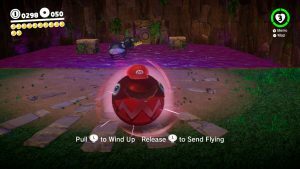 14 – Nice Shot with The Chain Chomp! 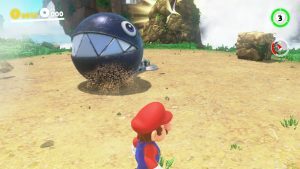 15 – Very Nice Shot with the Chain Chomp! 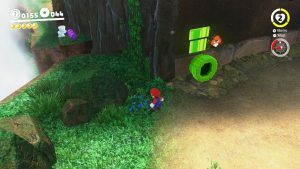 Head to the small path to the left of the Chain Chomps and into the pipe. 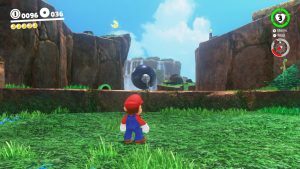 It’s a series of 3 puzzles where you need to use the large Chain Chomp to hit the smaller ones into the circular target. 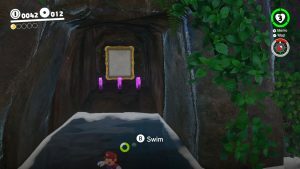 Before you leave come towards the camera and there is a small ledge on the left side to go to one more puzzle. Aim for the right side of the next Chomp with half the arrow off to the side. At the Stone Bridge checkpoint. Off to the right of the bridge is a path. 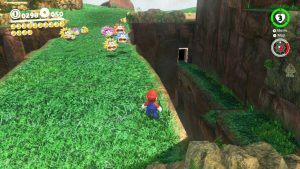 One path goes up to some Kingdom Coins while the other goes down to a door. Enter the door. 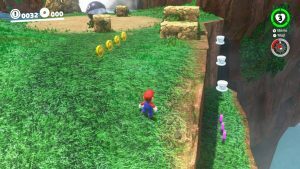 Work through the 2D/3D platformer until you reach 2 up/down platforms with Coin Rings between them. Before entering the Pipe fall down to the small ledge below and enter that Pipe. 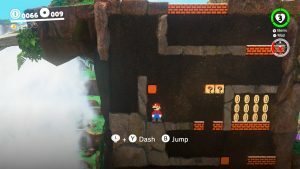 You need to use the Koopa shell to break the bottom right brick and then you can run behind the area to get to Hidden Chasm Passage. The head back and continue on to get Past the Chasm Lifts. 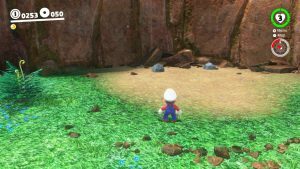 Then head to where the Odyssey was originally parked and there will be a couple boulders. Kick one around for quite some time until it breaks and reveals Rolling Rock by the Falls. 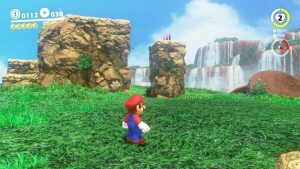 Once you’ve gone to the Sand Kingdom when you return to Cascade the Odyssey will now be parked down by Waterfall Basin. 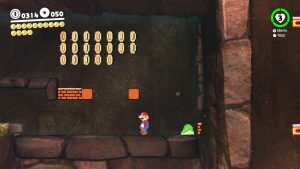 The Store will be open and you can buy Shopping in Fossil Falls for 100 Coins from the left merchant. Right behind you at the start behind a few rocks. 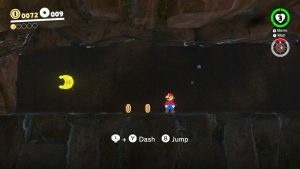 To the left of the 4 standard coins that are on a rock column, just on a lower ledge. Past the 3 hedgehogs off the right side on a small ledge. Under the bridge in the water. Head towards the waterfall and there will be a alcove with a painting. 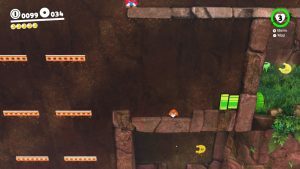 Use the Chomp Chomp to break the rock to reveal the pipe. 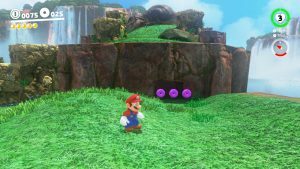 The 4 Purple Coins are off the back on a ledge. To the left of the flagpole where the parrot sits. On some rocks opposite the T Rex. Under the front of the T-Rex’s hill. 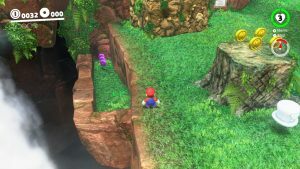 Head around the back left side of the Chain Chomp area and go past the pipe for now. 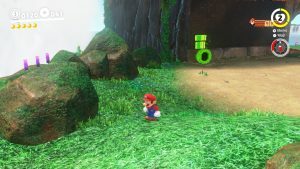 Throw Cappy to get the 3 Purple Coins. 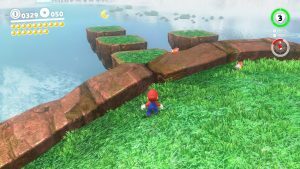 To the left of Stone Bridge is a series of rock outcroppings use these and Cappy Clouds to get to the Coins. Head into the door beneath the previous Coins. 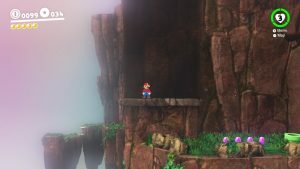 Follow the 2D platformer until you get to the area with 3 moving platforms. 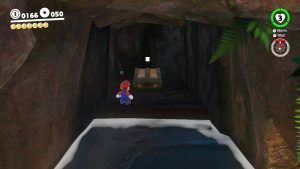 Ride the left one up and off the screen and then jump right until you reach the ledge way above the pipe. Follow that around for 4 Coins. One another rock column area after you cross Stone Bridge on your left. 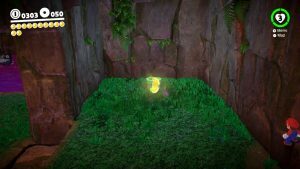 Just to the left of the entrance to the 2D Puzzle area hiding behind some rocks. 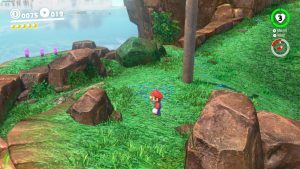 You can get here from Stone Bridge or from the Chain Chomp area. It’s a series of rock outcroppings behind the waterfall. 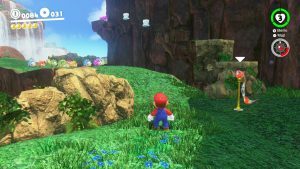 Off the back of the boss area is a series of floating rocks. 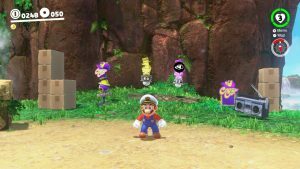 One has coins and another has a Power Moon.